SOMETHING happened during my journey yesterday morning (Wednesday) on the 274 bus just after it had pulled into Parkway, Camden Town. Out of the corner of my eye I spotted such a striking portrait of a young man hanging in the Novas Gallery that, impulsively, I knew I had to get off and take a look. I found a gallery that is staging an extraordinary exhibition, and I can only recommend readers take a look at it before it closes early next month. You won’t find strange installations at Novas that pass for art or puzzling abstract work. It seems two Camden artists – Tim Brown and Matthew Small – have decided that ordinary people can make great art. And ordinary building materials – sections of plaster walls and sheets of metal – can make wonderful canvas material. They have painted well-known local landscapes – part of the Kiln Place estate off Queen’s Crescent and the Abbey Road estate in West Hampstead – as well as the faces of youngsters who live on the streets, perhaps sometimes getting into trouble. One extraordinary portrait of a young man stares at you with challenging eyes, his arms stretched out like Christ on the cross. I gather from Matthew Small, a 32-year-old black artist who grew up in Gospel Oak, that he and Tim Brown, helped by the borough’s Youth Service, got together several youngsters and worked with them on the project. Matthew’s own life hasn’t been easy. His father left home when he was a child and he was brought up by his mother along with his brother. After leaving William Ellis school, he gained an arts degree and then completed a master’s at the Royal Society of Art where he was spotted by the owner of a well-known West End gallery. Today, he is a rising star in the London art scene. Exhibits at Novas range in price from £500 to £9,400. Since the exhibition opened on Thursday five works have been sold totalling more than £18,000. Upstairs on the first floor of Novas there are several portraits of some of the youngsters who collaborated with the artists. “I’ve signed them, and when the exhibition ends they’ll be given to the young people who helped us,” he told me. Judging by the prices at Novas they could be worth a tidy sum. I’VE never met anyone who could be compared to the great Greek playwrights – Aristophenes, Sophocles and Euripides. But when speakers at the 50th anniversary party of the Theatro Technis theatre in Camden Town on Thursday drew this comparison with George Eugeniou, I realised they had a point. What they meant was that, like the great Greeks, George had always been a seeker of the truth. “I have always wanted the theatre to be a space for ideas that will unite people and lead to a better world,” he told a packed audience. Against all odds he created the Theatro Technis. In the 1990s things got tough when the council withdrew its grant. Life turned full circle at the party because the borough’s mayor could hardly keep back her praise for George. THE phrase “I could’ve been a contender” is never more apt than when applied to Kentish Town optician Ronald Brown. I met the businessman, who set up the chain of north London spectacle sellers, at the opening night of an excellent boxing exhibition at the Jewish Museum in Camden Town. Ronald Brown, who owned the Ronald Brown opticians in Kentish Town Road, was the son of renowned boxer ‘Young’ Johnny Brown. His grandfather, also called Johnny Brown, was another famous boxer. 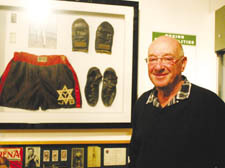 The pair were fighters in the first 30 years of the last century, and the exhibition includes momentoes of their careers, including gloves, shorts and belts, which Ron has kindly lent to the show. But I heard from Ron that despite being a keen sportsman – he excelled at tennis and football, banging in many goals as centre forward for Leyton Wingate – he was not allowed to follow the family boxing dynasty. ‘Young’ Johnny Brown went on to become a masseur, and worked for actors, including John Mills, Sophie Tucker and Max Bygraves, among others, and he hoped his son would find a profession away from the fight game. He said that the bouts were over quickly when he was involved. YOU may think of him as a bit obsessive. You could call him a workaholic. But if you were recovering from an eight-hour operation and the removal of part of your stomach would you lie in bed worrying about the state of local roads? But that is the inimitable Dugald Gonsal, aged 72, all over. Dugald, the man who ran the council’s highways department in the 80s and 90s, became one of the most extraordinary chief engineers the Town Hall ever employed. So, I could only chuckle when I received an email from him this week. In the first few paragraphs he lamented about his operation at the Royal Free – and then suddenly referred me to “Two things” I needed to be “alert to”. One was about planned repairs to Lawn Road and Fleet Road, Hampstead, and the other to a speech he is due to deliver today (Thursday) at a national conference in Northampton on the nation’s roads. When I rang him late on Tuesday evening, I was surprised to catch him working on his speech. He brushed away my fears that he should take it easy after his serious operation six weeks ago. I got worried when he told me that he had had to be admitted to the Free over the weekend because of complications. But nothing, it seems, daunts Dugald. His speech today will illustrate the steps the council took nearly 20 years ago to stop back-handers being paid by contractors to council officials. The scandal of the corrupt officials at the Town Hall was never made public, Dugald told me. Following advice from the police, the then chief executive, Jeremy Smith, sacked the six men – and later Dugald’s corrupt-proof system was introduced.